The last Eagles franchise quarterback worthy of the title ran out of the old familiar tunnel into a strange new world. Donovan McNabb wore a bright - dare we call it kelly? - green shirt as he made his way between rows of the former teammates and total strangers that comprise the 2013 Eagles. It was a jog he made many times during his career, but it was never like this. For one thing, it was a training camp practice, something he experienced only at Lehigh University. For another, there was no sign of Andy Reid. For yet another, McNabb never participated in a practice here where he didn't know who the No. 1 quarterback was. After McNabb received his standing ovation - a roar of approval on par with those for fellow alumni Brian Dawkins and Brian Westbrook - he left the field to the five men trying to win Chip Kelly's QB version of The Bachelor. If you are looking for clues to how it will all play out, they were not to be found Sunday at Lincoln Financial Field. 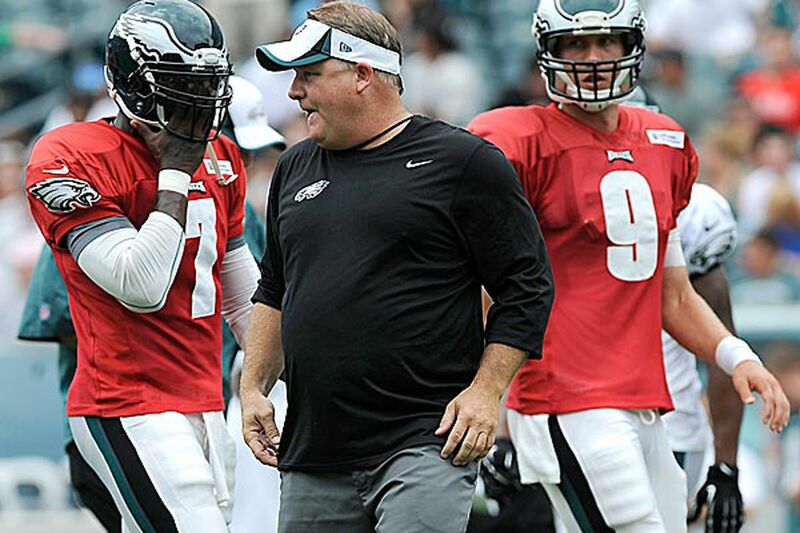 No one can blame you if you're already a bit fatigued by all the speculation and debate about Michael Vick and Nick Foles and Matt Barkley (and Dennis Dixon and, of course, G.J. Kinne). But this was the first practice of the summer in full pads, as well as the first fully open to the public. Kelly has said that a starter would emerge during camp. This was, theoretically, the first real chance for someone to take a discernible step forward. If anyone did, it was impossible to detect. The pads notwithstanding, there was no real hitting Sunday afternoon. There was live blocking, but no tackling or serious contact. "We're going against our own team," linebacker DeMeco Ryans said. "It's not about banging each other. We're going to need each other." Kelly did not talk to reporters after the session, so we don't know when he plans to introduce the live hitting he says is required to evaluate the quarterbacks - or anyone else, for that matter. Clearly, this team remains in teaching mode, the players still following the dance steps printed on the floor. That's how it looked, anyway. The play was ragged all around. None of the quarterbacks looked particularly accurate or authoritative. On one play, tight end Clay Harbor exploded off the line, ran his route, and turned to face Vick. Trouble was, the ball hadn't been snapped. Harbor just stood there until the rest of the receivers took off, made their breaks, and turned toward the QB. Vick threw it to Harbor. Under every other Eagles coach in memory, the play would have been stopped when Harbor jumped. Kelly keeps things moving. Mistakes are addressed later. So the sausage is being made in real time, in front of thousands of witnesses. Kelly's approach - in which a QB runs three or four plays in hurry-up mode, then steps back and is replaced - makes it very hard for spectators to get a sense of how a QB is doing. It's not as if Vick gets a drive, then Foles. That game-style approach makes it easy to see who is moving the offense, and who is not. Presumably, Kelly is seeing what he needs to see. Going in, I wondered whether this camp format would affect public perception of the QB derby. The five open practices and four preseason games will provide the only firsthand looks for most fans. If someone looks better in those circumstances but someone else excels in the daily grind at the NovaCare Complex, the view could get distorted. But this practice didn't provide enough insight to form any kind of a judgment. And the preseason games are always a bit skewed, with the first team trying not to put any secrets on tape and the third team playing glorified sandlot ball against the other team's scrubs. So this competition is going to play out on the video screen in Kelly's office more than on the public stage. It isn't going to matter what we see, or think we see, only what the coach sees. And that's fine. Kelly will be on the hook for his decision, no matter how it is made. After practice, McNabb chatted briefly with Vick outside the Eagles locker room. There wasn't any question of which was the last man worthy of the title of franchise QB, only of how long he would remain so. Contact Phil Sheridan at psheridan@phillynews.com. Follow @Sheridanscribe on Twitter.